Laura Schmitt NE: Coconut Ice Cream Dairy Free and Gluten Free, Sugar Free and Soy Free too! Coconut Ice Cream Dairy Free and Gluten Free, Sugar Free and Soy Free too! Yum...it's summer time here when the temperature hits 90+ like it did today. 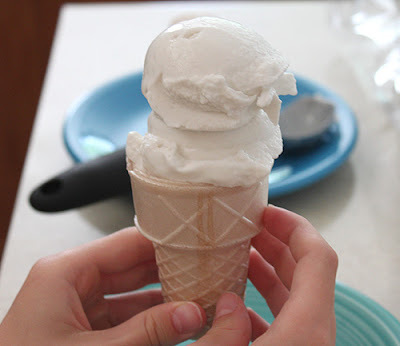 What better time to whip up a batch of all natural homemade coconut ice cream? Pictured with gluten free ice cream cone. Join us for class 3 in the series of unleashing your natural chef to see prep and taste the product of this delicious summer time treat, in addition to other creative and wonderful tasting sweets that deliver creative nutrients, no refined sugar, no gluten, and no dairy. Click Here for details on upcoming class.